Act fast ... it's time to finish prepping. Limited-time stealth discounts available with email-only coupon codes. We're all indebted to the sacrifices our military veterans make to keeping America great. Safecastle salutes all veterans and their families! We wanted to do something in honor of our veterans and decided on offering a crazy discount on the famous military-grade Katadyn Pocket. 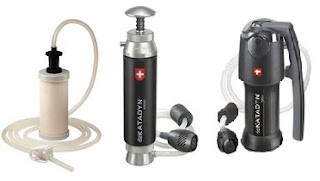 And while we were at it, we also added the Katadyn Vario and Katadyn Siphon to the offer ... 25% off our already discounted pricing! Clean water is always your number one priority, and Katadyn is the most respected name in the portable filtration field--be sure you and your loved ones are ready! Fire Base & Drawstring carrying bag are included as Standard Equipment with each Kelly Kettle. Keep 12V batteries charged and ready to go for when you need them most. system to protect your batteries when they're not in use..
hand crank for bright light anywhere. port to charge your phone..
health care equipment as well as CPAP machines. Independently Certified 100% GMO Free Great Tasting storable foods. Simply the best money can buy. We even offer No Gluten pasta dishes. Just because you are allergic to Gluten doesn't mean you shouldn't have variety in your diet. Quinoa, Par Boiled Rice, Spelt, Brown Jasmine Rice, Chia Seeds, Sprouting Seeds. the most rugged, longest lasting micro filter available. The Katadyn Vario is the first-ever water filter to combine the benefits of long life and fast flow in one product! Free-standing gravity filter with a 2.5 gallon water container for large quantities of water. Filters without effort. More Filter Products click here. This is the filter you've been hearing about. Labels: camping emergency, Expo, filters, food, food shortage, goal zero, katadyn filters, Kelly Kettle, lifestraw, light, numanna, Self Reliance, SHTF, storage food, Travel, water filters, Why prepare? 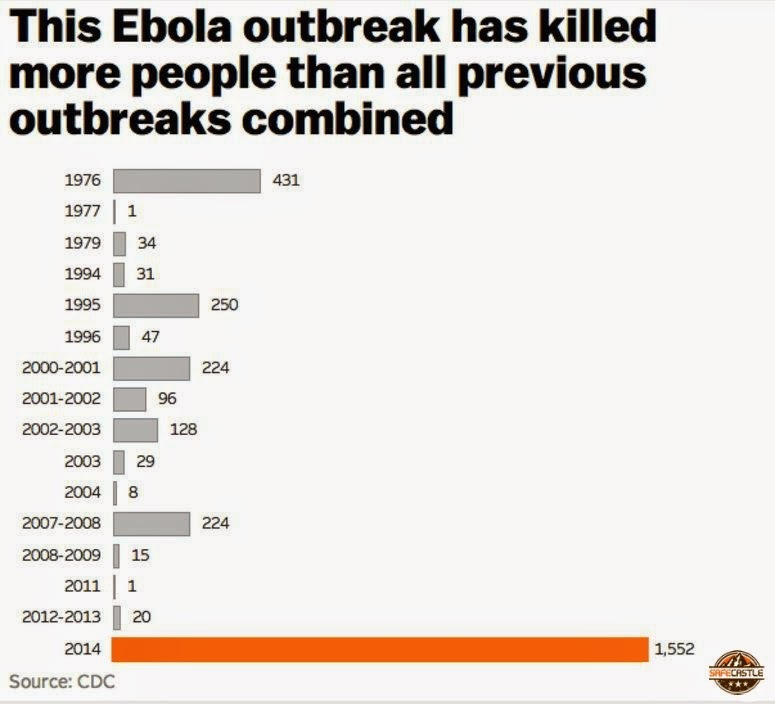 This Ebola crisis is indeed deadliest in history. Center for Disease Control and prevention has updated recently the ebola toll- Suspected and Confirmed Case Count are 3069, Suspected Case Deaths are 1552 and Laboratory Confirmed Cases are 1752. With so much happening, here are 15 things that you should know about this virus. Ebola is aggressively infectious, which means that those infected are highly likely to get sick. But it's not very contagious, meaning it doesn't spread easily. Ebola doesn't jump from person to person through the air. It's transmitted only through bodily fluids while the infected patient is exhibiting symptoms. US experts say our health care system would be able to identify and contain the virus swiftly. Thus there are moderate chances of its spreading in our country. Hence, there's no need to panic about the Ebola patients returning to the country. Fruit bats are considered to be virus' natural host. Ebola kills up to 90% of those infected. There is no proper vaccine or cure devised till date since its first discovery in 1976. Many studies and researches point towards finding a cure for the disease, but many doubts persist on its effectiveness. Ebola can last two to three weeks, so patients would remain in isolation until their symptoms subside and tests come back negative for the virus. The only reason the current outbreak is so bad because it has hit in places with poor health infrastructure and facilities. Signs and symptoms of Ebola include fever (greater than 38.6°C or 101.5°F) and severe headache, muscle pain, vomiting, diarrhea, stomach pain, or unexplained bleeding or bruising. 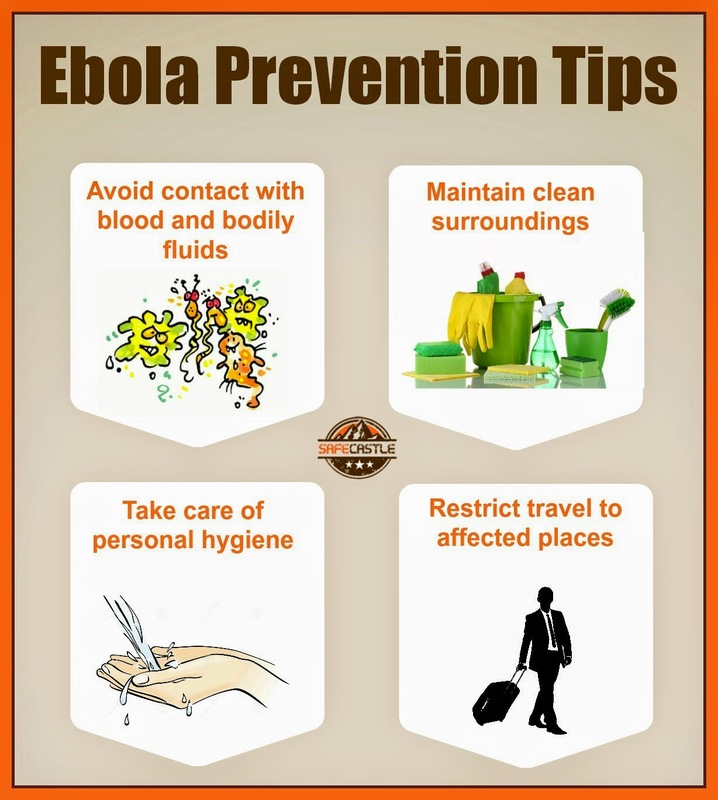 Signs and symptoms may appear anywhere from 2 to 21 days after exposure to Ebola, although 8 to 10 days is most common. Some reports suggest that the basic techniques for stopping Ebola are well known. The challenge is applying them. WHO head also says that the virus could be stopped if well managed. Decontamination is a necessary process when exposed to such bio-medical threats. Labels: bio-medical, Biological preparedness, Ebola, filters, How to be ready, katadyn filters, Nuclear preparedness, outdoors, Prevention, Radiological preparedness, safecastle, Travel, Why prepare? In a survival situation, clean drinking water is your most important resource. Depending on the environmental conditions and your physical activity, a person cannot safely go longer than a few days without water. If you are embarking on a household preparedness effort, water needs to be at the top of your list. Plan for at least one gallon of water per person per day to satisfy drinking and food-preparation needs. Beyond that, additional water is needed for hygiene. It’s good to have on hand several different capabilities for purifying water at the time it is needed. Boiling: The old standby and probably the best method is the ability to boil water. Boil for at least 10-15 minutes to kill most bacteria, parasites, and viruses. Allow to cool to room temperature. Chemical disinfection: The next best option is to use a proper dosage of a commercially produced water purification tablet, such as Katadyn Micropur, Coghlan’s, or Potable-Aqua. Iodine products such as tincture of iodine or crystalline iodine are also effective. (Important: iodine can be lethal if used in quantities greater than recommended and iodine-treated water should not be used by pregnant women or consumed by anyone for more than a few weeks at a time.) Note that cryptosporidium and other parasites may not be killed using chemical disinfection methods. Be sure to follow directions for each product with measured water volumes. Portable water filters: The thing to look for with water filters is the filter’s absolute pore size. Filters are designed to remove parasites (Giardia/Cryptosporidium) and have "absolute” pore sizes of 0.1 to 1-micrometer (the smaller the pore size, the better). They will also remove most diarrhea-causing bacteria. Most portable water filters do not remove viruses so chemical disinfection is recommended after filtration. Chlorine (NOT a good option): Chlorine has been thought by many to be a reliable way of treating water, but it is risky doing so, since chlorine degrades so quickly (within months of manufacture) and loses its efficacy. Iodine or other stable water-treatment chemicals are more effective. Labels: How to be ready, katadyn expedition, katadyn filters, katadyn mini, katadyn pocket, survival, water filters, Why prepare?